Eaton RE Series IT Rack The new RE Series of Racks from Eaton expands our ability to provide end to end solution for todays Converged Infrastructure (CI) applications. Building on the strengths of Eaton’s extensive range of power management and distribution products, the RE Series of pre-configured racks provide simple to choose options to meet the requirements of common application demands. 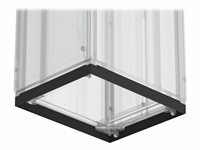 Eaton REC Series IT Rack The REC Series IT racks provide excellent protection for IT equipment in small, medium and large data centre applications. Designed for fast and easy set-up, the REC Series is provided with features IT specialist need in an affordable, ready-to-go enclosure. A full range of easy-to-use cable management, airflow management and storage accessories are available to help you keep your rack neat and well organised. The REC Series can also easily be assembled into aisle containment configurations with pre-fabricated end-of-row doors and horizontal roofs which are simple, fast and easy to install. High value IT rack with uncompromising quality Easy expansions and refreshes through modular rack construction. Robust and long lasting frame Class leading 800 kg static load with patented self-squaring bolted frame. Increase user convenience Quick-release sides for access. Casters and leveling feet fitted as standard. Prolong IT equipment life and save energy 80% free area perforations for maximum air flow. Secure IT equipment long-term With 2-point lockable sides and doors, removable for easy access, IP20 rating. This is Eaton's most cost effective Data Center compliant rack solution. 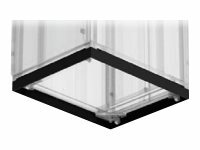 It has pre-fabricated ceiling containment and end of row doors for simple, fast and easy installation. Stepless 19'' rails, field-reversible doors, grounding wires are included. This product has 1100kg static load with patented 4 post self-squaring bolted frame. It has quick-release sides for access. Casters and leveling feet fitted as standard. 80% free area perforations are for maximum air flow. You can upgrade kit options such as a range of top panel kits and other accessory options. It has 3-Point locking on doors and key lock sides, removable for easy access, IP20 rating. It is compatible with rack mounted UPS and PDUs. Accessories include cable management, shelves and blanking panels.